It’s officially baking season. The weather is getting cooler, and the leaves are falling off of the trees. It’s time to get baking. 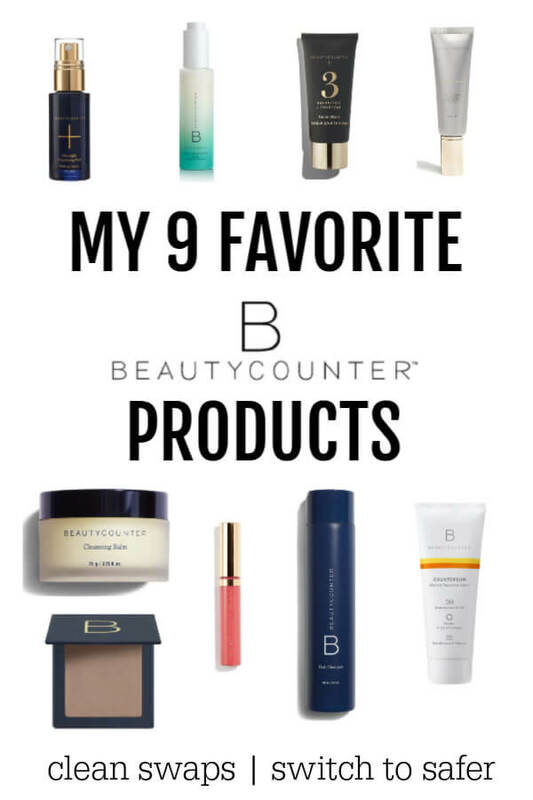 Cookie, muffins, pies, custards… you name it, I love it. I adore the smell of sweet, warm spicy treats pouring out of the oven. And I love to see the happy faces of the ones I love enjoying the goodies that I make. I’ve been on a custard and flan kick lately. Many recipes call for condensed milk, but I would rather not use the canned stuff that is loaded with questionable ingredients. 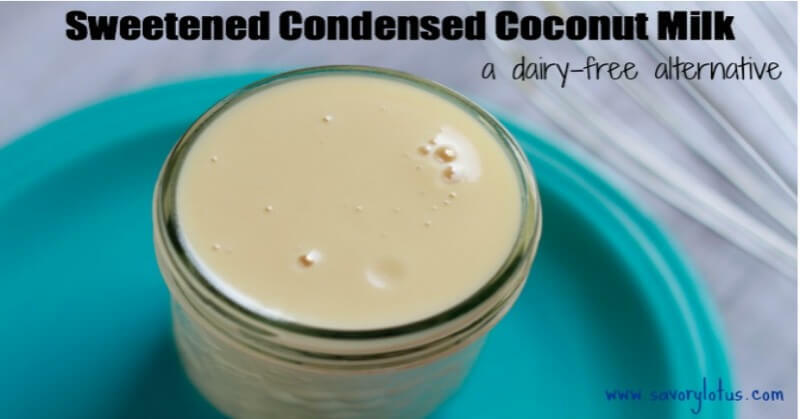 Today I am sharing with you a simple dairy-free alternative to commercial sweetened condensed milk: Sweetened Condensed Coconut Milk. Don’t get me wrong. I don’t have anything against dairy, as long as it’s from an organic, grass fed source. And as long as it’s RAW. The gallon of RAW milk that I get every week is too precious to cook down into dessert ingredient. Fresh, RAW milk is like gold. Full of vital nutrients and enzymes, it feeds and nourishes us to the core, especially my Little One. I find that using a can of full fat coconut milk is a much better alternative when I want to have a creamy base for my pies, puddings, or custards. And once you taste this creamy, delicious nectar, I think that you will have to agree. Sugar, Skimmed Milk, Milk Fat, Modified Starch (Ingredient Not in Regular Sweetened Condensed Milk), Corn Starch (Ingredient Not in Regular Sweetened Condensed Milk), Sodium Phosphate (Ingredient Not in Regular Sweetened Condensed Milk), Soy Lecithin (Ingredient Not in Regular Sweetened Condensed Milk), Natural and Artificial Flavors, Carrageenan (Ingredient Not in Regular Sweetened Condensed Milk), Agar (Ingredient Not in Regular Sweetened Condensed Milk), Salt (Ingredient Not in Regular Sweetened Condensed Milk). Yeah, pretty incredible. Right? But don’t worry. 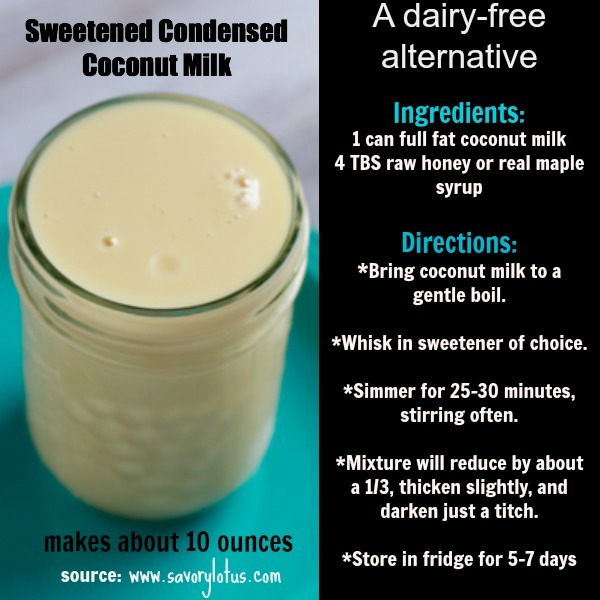 You can easily make your own sweetened condensed coconut milk with only a can of good quality, full fat coconut milk and some RAW honey. I have also made this with maple syrup. Both are delicious. I wish I knew who to give credit to for this recipe. I learned to make this at a yoga retreat I went to years ago, and it just became part of my baking repertoire. 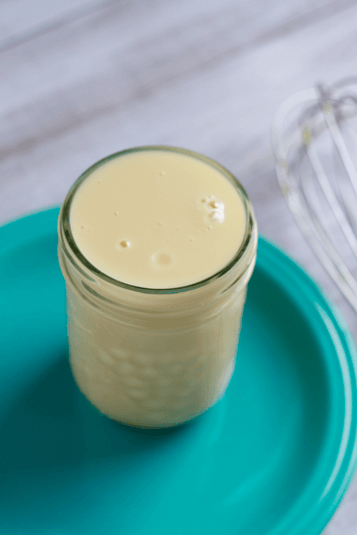 This wonderfully simple mixture can be used for pies, pudding, custards, as a decadent coffee or tea creamer, on porridges, and for anything else that requires a creamy base. Basically, it makes everything creamier, richer, and deliciously sweet. Enjoy! And happy baking. Allow to actively simmer (never boil) on medium heat for 25-30 minutes, stirring OFTEN. Mixture will thicken slightly, reduce by about a 1/3, and darken just a titch. sounds great!! do you use this in rich dessert recipes, like fudges and pies and it works just the same as traditional/dairy ingredient? 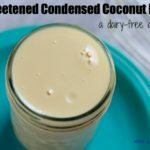 Katja, have you ever made sweetened condensed milk with a different milk (rather than coconut)? For many desserts I use either this recipe or Coco Lopez cream of coconut (the stuff that goes into your pina colada! ), but I want to make vanilla caramels that don’t taste like coconut…any ideas? I tried with almond milk but it just didn’t work and had a funny taste. Thanks! Hi, Robin! I have not tried any other milk besides coconut. Sorry! Coconut works because it has such a high fat content. No other dairy free milk will work the same way. You could try adding maple syrup to the coconut milk when condensing it to make more of a maple flavored milk to use in your caramels. 🙂 Thanks for coming by! Great recipe. I would probably lean more toward the maple syrup, though, as I’ve read cooking honey makes it toxic (according to Ayurveda). Look forward to giving this recipe a whirl. Thanks! I just tried this out this evening. It took over 50 minutes before it stopped looking watery but it’s still not really thick. Any ideas what I might of done wrong. My coconut milk was full fat. Coconut cream is the thick “cream” from the top of the milk. You wouldn’t be able to apply this process as is is too thick and wouldn’t reduce down the same way. It would be a totally different consistency. This looks great! Do you have a canning recipe for this as I would like to put several jars up? I haven’t tried canning them. You would need a pressure canner. Not sure what the timing would be. Freezing this would work as well. I’m really excited to see you say freezing this would work … I don’t know if I could use it all up in 5-7 days. I think I might try putting it in ice cube trays and then adding it to my coffee to either make iced coffee or just to lighten/sweeten my coffee. “Thai iced coffee” is made by adding sweetened condensed milk to a very strong French roast coffee … so this is a perfect Paleo alternative!!! One question: What about using coconut sugar. Do you think that would work? Or do you need the liquid element of the honey or maple syrup? I think freezing it in ice cubes is a great idea. I haven’t tried coconut sugar. I bet it would be delish! Sound really good! I can’t wait to try it, but I think I will add the honey after reducing and cooling the coconut milk. I think that cooking would destroy the “goodness” in it 🙂 Cheers, Monika. Yes, that’s a great way to do it too. Raw honey is the best! Put ingredients in blender and whip until smooth. I have also put this in a mason jar and simmered like they do the cans of sweetened condensed milk and it makes a great caramel sauce topping. I have never heard of dried coconut milk powder. Will have to check it out! If anyone’s interested, I just tried this recipe by Dorsey here (slightly modified), and am happy with the outcome. I used 1C coconut milk powder, 1/3 C boiling water, and stevia to taste. I did not add butter. I also didn’t blend the mixture in a blender as I was too *cough* lazy *cough* to do the clean up ;D, so I just whisked it in a bowl till a bit frothy. Is there any sort of separation in the milk after it’s been reduced? As mine was cooling on the counter it looked as if coconut oil was on the bottom and milk on top. Is this normal? That’s what happened to mine. After being on a high simmer for 40min I poured it into a mason jar and as it cooled it separated into a watery layer on the bottom, a creamy layer in the middle and a greasy solid oil layer on the top. I’m kind of bummed because I sure don’t want it in my coffee now. So sorry to hear about this. My guess is that the mixture was cooking at too high of a heat. Try a gentle simmer next time. How do we know if our coconut milk is full fat? Some will say lite, or low fat, but others don’t say. A can here is 398mL, is that the same where you are? It has been my experience that if it just says “coconut milk” then it is full fat. The cans of coconut milk that I use have about 72 grams of fat in them and are 400ml. And it sounds like the evap. milk that you have is better than most. I love this dairy free version though. It tastes sooooo much better. Thanks so much for stopping by! Just wondering if I was to add protein powder to it would it ruin the creamy texture? Would I be able to add more milk/water to it to keep it the same? Can’t wait to try this in my dads banana pudding for Father’s Day! I’m wondering though, will homemade coconut milk work the same. I always make my coconut milk by puréeing unsweetened coconut flakes & water then straining through cheese cloth. I never buy canned or box coconut milk, as this method is more economical for me because I also get coconut flour out of the process. Double win 🙂 Each batch I make does produce a very thick layer of fat at the top that I just shake to mix when I need to use it so I’m hoping it will have enough fat & be thick enough like the cans. Could you use almond milk? Or would that not work very well? Does one can of coconut milk equal one can of sweetened condensed? One can of coconut milk doesn’t equal one can of regular and after boiling, it’s even less. Just curious. Can’t wait to try it in my recipe tomorrow! I wonder if she’s asking if this recipe is equal to what a can of condensed milk would be in a recipe? I am wondering that also. I’d like to try it when we make homemade ice cream. We usually use 2 cans of Eagle Brand. So would I just double this recipe? I’m so happy to have this recipe, as I am severely lactose intolerant, yet love my Vietnamese coffee. It’s very ease to make. This really makes a delicious Vietnamese coffee! Yay! I’m so glad that you liked it. I miss dairy sometimes but have been finding ways to still have my favorite foods too. 🙂 Thanks for the feedback! Good heavens, thank you very much for posting this! It is going to aid me when I get Coconut Milk at the grocery store! Astonishing! 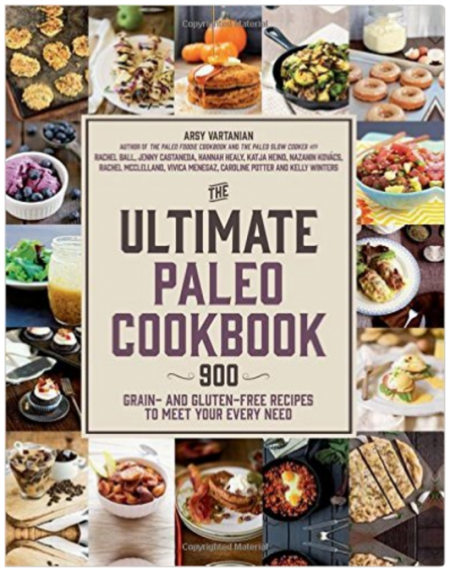 I know this recipe is paleo but can it also be made sugar free with erythritol or stevia or some other sweetener? I would love to have this but less sugar. I tried this but it curdles in my coffee. What did I do wrong? Do you mean that it separated? I have heard that sometimes the acidity of coffee or tea can make creamers separate. It has something to do wit the pH. I have not noticed this myself but I usually drink herbal teas. I have used this is my coffee and have not noticed a separation. I have seen oily separation with coconut milk before though. It’s not a sign that it is bad though. I shop Trader Joe’s so i have Coconut cream and Light Coconut milk. Think I could mix them? Hi what yoga retreat did you go to? Do they teach you how to make things like this? It was a yoga retreat many years ago in Northern California. We didn’t learn recipes but they used this as the creamer in the kitchen. I asked them how they made it. Hi, Ellen! I have not tried freezing it. I bet it woold be easy to do in ice cube trays. Let me know if you try it. I just made this this morning and used it in my mac ‘n cheese. Unbelievably creamy! I put it in the slow cooker for just over an hour, but would be great bakes also, which is probably how I’ll warm it up. How do you store it when it’s done? In the fridge? I store in fridge. It usually lasts 3-5 days. I’m wondering if this could be A, made in a slow cooker, and B, made from coconut milk powder? Have you tried this recipe using the maple syrup as the sweetener in a key lime pie or lemon meringue pie? Just curious if the maple taste was too evident. Thank you! Could I add orange juice during the boiling process to flavour the condensed milk? Or would I have to wait until it’s cooled and add it then. Hi, Julia! I have never tried to flavor this, so I can’t promise that it will turn out. I am wondering if extracts would not work better for flavor. Added after it’s cooked. I am having the same problem as candace with separation. I have now gone through two batches and looks nothing like how it should. my first batch i used ‘natural value’ full fat coconut milk (without guar gum) and after cooking it separated, with a thick play-doh like substance and what appears to be coconut oil. My second batch was with ‘native forest’ organic original coconut milk (with guar gum) and it looked a lot better until i removed from heat and once again it separated. What am i doing wrong here? I use coconut nectar to sweeten my foods, I’m going to try it. So do I follow the instructions and whisk it in (step 2)? Thanks for the recipe and how to make it! Could I substitute it in my lime recipe? I use 1 can of regular condensed milk, plus lime zest and lime juice then I bake it, for firmness… I would like to know if I can substitute it for the coconut condensed milk and still bake it…! As long as it’s the same amount of liquid, I think it should work just fine. 🙂 Sounds delish! Hi, Ashley! The reason I recommend raw honey is that some brands that just say honey are actually adulterated with other cheap sweeteners. Yuck, I know. But people are dishonest and will add HFCS to make the honey cheaper to produce. So I always look for RAW on the label. I haven’t tried that, but I bet it would be great. Let me know how it goes if you try it. Would you be able to make Dulce Delece by leaving this cool for a longer time? My coconut milk wouldn’t boil or simmer, why?? Tha fat was only 18 %, is that why? I continued anyways and it thickened after 35 minutes. The kind of milk you’re talking about, that comes in a can, right? Not coconut milk that you drink in a glass? Yes, I use a full fat coconut milk from a can. It’s hard to say what happened with yours without being there. But this recipe definitely works with full fat coconut milk. Hi Katja! I have a question regarding coconut milk in general. Yes, full fat coconut milk does have a slight sweetness to it. But not sure if it’s sweet enough to sweeten coffee or tea. Depends on your taste buds. Curious, can Agave be substituted or truvia sugar substitute be used? I haven’t tried that. I’ve only made it with maple syrup and honey. But please let me know if you do. 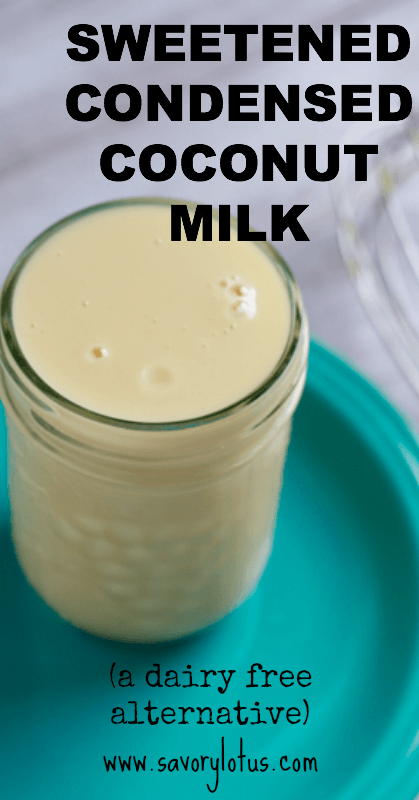 Do you have measurements for cups of coconut milk to tbsp of honey/syrup vs “cans” of milk? I buy the half gallons of coconut milk. Also, have you used your condensed recipe to make a key lime pie? I attempted to make a key lime pie yesterday using coconut milk and coconut sugar in replace of sweetened condensed milk and was a huge fail. It never set and stayed completely liquid…?